INDIANAPOLIS (AP) Suddenly, the Butler Bulldogs have figured things out. Their offense is working, their defense is improving and the wins are starting to pile up. It’s even hard for coach Chris Holtmann to find faults right now. Nate Fowler scored 15 points, Kelan Martin added 14 points and eight rebounds and No. 24 Butler took advantage of two big scoring runs to blow out DePaul 82-66 on Sunday for its first back-to-back wins in almost a month. Butler’s resurgence couldn’t come at a better time. With trips to No. 2 Villanova and Xavier looming later this week, Butler (21-6, 10-5 Big East) has sole possession of second place in the league and a chance to pad an already impressive NCAA Tournament resume that includes five wins over ranked teams. But after a rough patch, which included three losses in four games, the Bulldogs are again playing their brand of selfless basketball. Just four days after five players scored in double figures in a 24-point victory , four players did it again Sunday – with Fowler, Martin and Tyler Lewis all coming off the bench. Lewis finished with 10 points and eight assists. Avery Woodson was the only starter in the club, scoring all 12 of his points on 3-pointers in the first half. The defense was even more impressive. Butler didn’t allow a point over the final 4:52 of the first half or the first 2:48 of the second half and didn’t allow a basket for nearly 9 minutes. The Bulldogs took advantage by scoring 21 consecutive points to turn a 27-22 deficit into a 43-27 lead early in the second half. DePaul didn’t get closer than 11 the rest of the way, and Butler sealed the win with a 13-0 spurt. Eli Cain scored 24 points and Joe Hanel had 10 to lead DePaul (8-19, 1-13), which has lost 10 straight. DePaul: It seems there’s no way out of this dismal stretch. The Blue Demons have lost 15 of 16, the last five by at least 11 points, are assured of finishing last in the Big East and still must visit Georgetown and Providence and finish at home against Xavier. Butler: The Bulldogs could climb in the Top 25 this week and will take momentum into this week’s crucial stretch. Butler has won consecutive games for the first time since beating Seton Hall on Jan. 25, the final victory of a four-game winning streak. DePaul guard Billy Garrett Jr. didn’t have the send-off he had hoped for in what will likely be his last game in Indiana. Garrett was 3 of 8 from the field with nine points and three 3s. Though he grew up in Chicago and his father, Billy, is a DePaul assistant coach, the family name has historic significance in the Hoosier State. Seventy years ago, Garrett’s grandfather, Bill Garrett, won Indiana’s coveted Mr. Basketball Award after leading Shelbyville High School to the state title. He later became an All-America at Indiana and was the first African-American to start regularly in the Big Ten. The eldest Garrett also won the 1959 state title as the coach of Indianapolis Crispus Attucks. The 45-year-old icon died of a heart attack in 1974, and was buried at Crown Hill cemetery, a few blocks from Butler’s campus. One reason for the Bulldogs’ recent success is their zone defense. Holtmann wouldn’t give any trade secrets about what they’re doing, but it has made a difference on and off the court. DePaul: Heads to Georgetown on Wednesday, hoping to snap a six-game losing streak in the series. 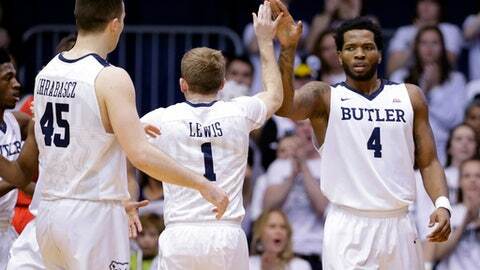 Butler: Can sweep the defending national champs on Wednesday in Philadelphia.